First four days of sailing are going pretty well. No one is seasick yet, but that is probably because of the general lack of wind. We have been sailing more or less close to the coast, taking advantage of the land-sea wind effect. Other than that the ocean off India’s west coast is pretty windless at the moment. Being close to shore however means that there are a lot of fishing boats on our way and we need to be extra careful with those. Some of them are quite tiny and have no lights at night. Another problem is that their fishing nets are virtually invisible so you never know if you are passing over them. Which can be a huge problem, especially when we are motoring. A fishing net in the propeller at night is no fun. We have had at least 5 visits from local fishermen every day. They come to say hi, ask for “drink” and “cigrattes” and offer fish to sell. Sometimes they won’t leave until we start filming them. Some were pretty nice and gave us fish for free after they asked us to go around their net and we politely changed course. So far our progress has been slow but we have been trying to use the wind as much as possible. We motored for a few hours yesterday when there was no wind but basically we have been moving slowly but surely towards the southern tip of India where better winds await us, at least according to passageweather.com. Once we go around Sri Lanka, we will be following an east-southeast course towards Sumatra. Every day so far we have stopped when there was no wind. Some swimming in the open ocean that was refreshing. I am fighting my fear of deep water (something like fear of heights, I kinda panic when I look down into bottomless water) and had some short swims around Liberty. 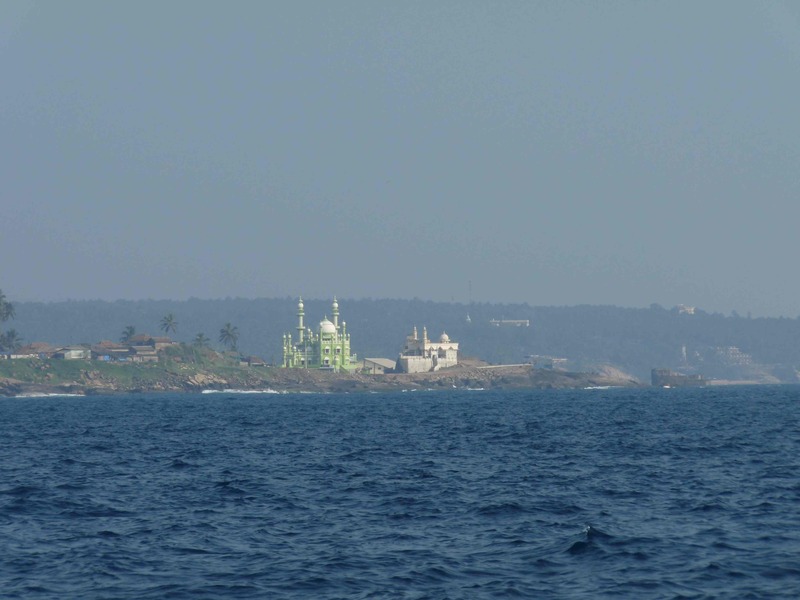 We just got pretty close to the shore at Trivandrum and did some sightseeing and used the internet. My phone, that acts like a router, is hoisted up the mast for better signal. That’s how we found out about the owl sleeping on top of our mast today. This will probably be the last time we have internet before East Timor, which will be at the end of January at the earliest. Don’t forget to follow our spot messenger locations on Gerd’s profile. We hit a place where currents meet and deposit all the garbage that is carried around the ocean. 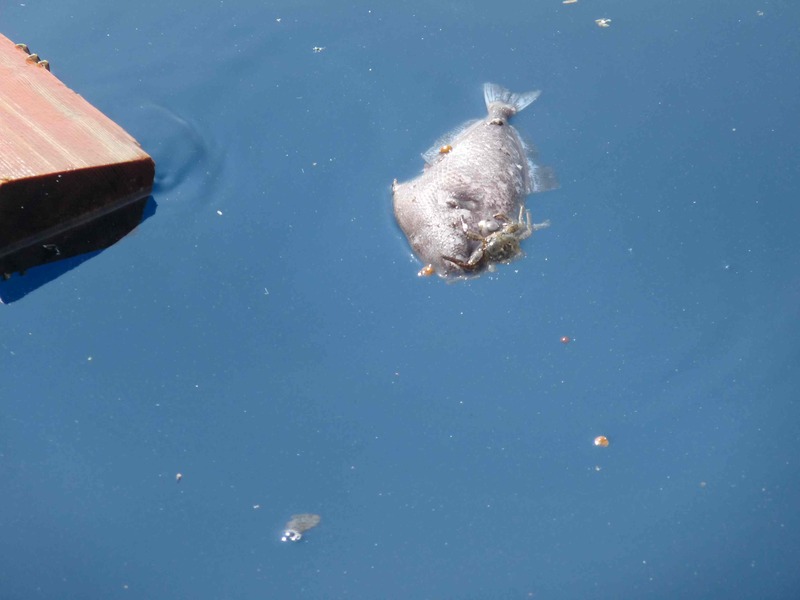 This dead fish was floating around, acting as support for a lonely crab. Sailing and sightseeing close to Trivandrum (full name Thiruvananthapuram – now say that out loud). As some of you may know, I am currently in Kochin, in the south of India. 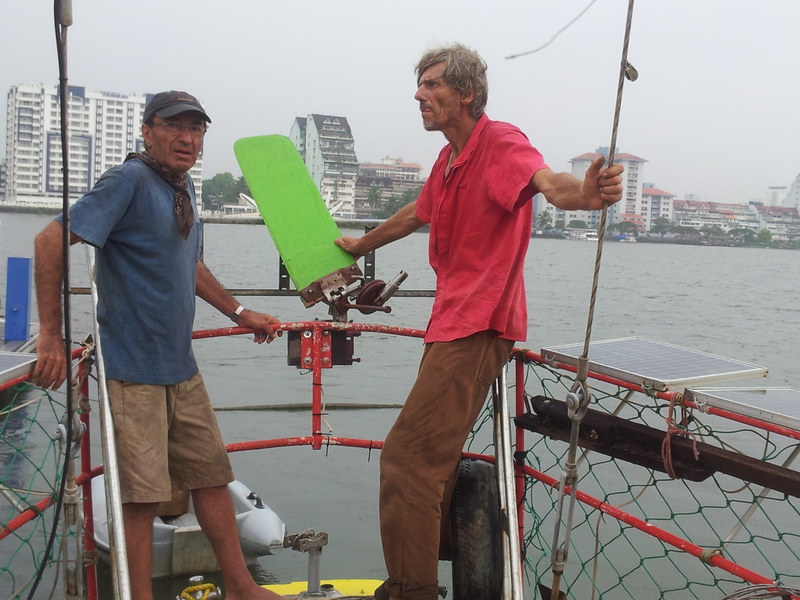 Together with two other people, captain Gerd and Andres, we are preparing the sailboat Liberty to sail east from here. We have been here for over a month now, working hard on everything from repairing sails to cleaning to working on the engine and self-steering. Liberty will be slowly making its way to New Zealand in the next 12 months. The first leg of the route will be the longest open ocean passage of the whole trip. 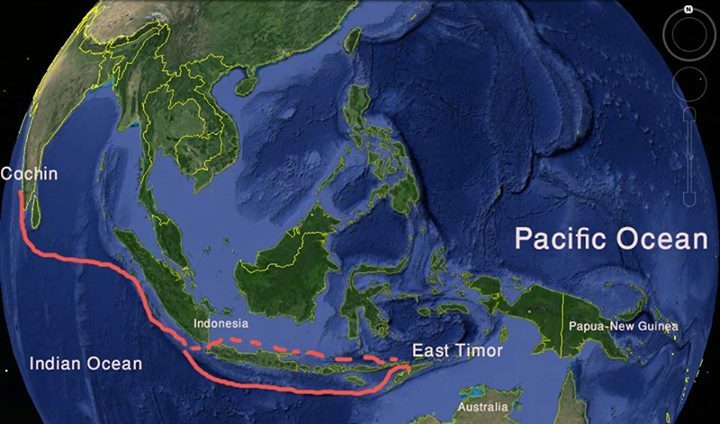 From India to East Timor passing west and south of Sumatra and Java. The route for the beginning of our trip. This leg should take 40 to 50 days of sailing, a lot in open ocean without much connection and certainly no Internet. In East Timor we are planning to stay some days, explore, pick up some new crew members, provision and continue more east, where the real exploring will begin, all throgh Melanesia: Irian Jaya (the western part of New Guinea, that is part of Indonesia), Papua New Guinea, Solomon Islands, Vanuatu and New Caledonia are on the route before the end of the trip in New Zealand. Captain Gerd from Switzerland, who owns Liberty and has spent a lot of his life sailing and living around the Pacific. Andrés is from Mexico. He has spent a lot of time travelling and certainly wants to be a sailor too. Originally we were going to be six people sailing out of India. 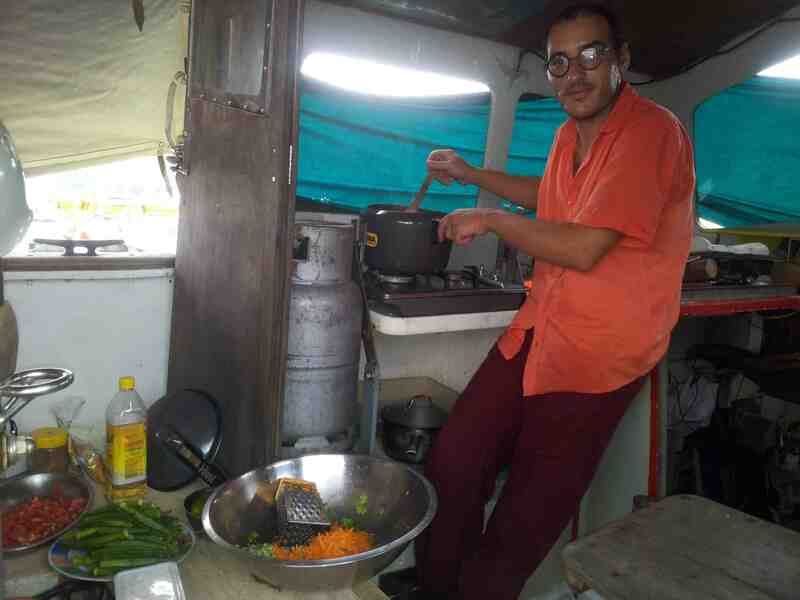 Ali, Majed and Ryan spent time with us, helping preparing the boat but had to leave for different reasons. For the time we spent here together we had a great time and it was a bit of a downer for me that they would not come with. Hopefully we will be able to travel together later. Ryan is from Alaska. He is 21 and took a year off his geology studies to join this trip. A very polite and mature guy. I really hope he will be able to join us in East Timor. Majed is also from Iran and is a documentary filmmaker. He wanted to make a film about this trip. He has filmed a lot in war zones in Afghanistan and Lebanon so he should be pretty well prepared for this adventure. And last but not least: my humble self. I joined this trip for a few of reasons. Firstly, I have been interested in visiting Melanesia (Papua New Guines, Vanuatu, Solomon Islands etc.) for a long time. This part of the world is not very easily travelled due to its remoteness and lack of infrastructure. All of it is islands, big and small, so travelling by boat makes perfect sense. When I was in the Cook Islands and Fiji in 2008 I found Pacific islanders to be very friendly, sane, proud and relaxed people and I certainly want to explore more. The land- and waterscapes are of course picture perfect. But most of all, for some time now I have been thinking about working with endangered and/or undocumented languages and Melanesia has the highest linguistic diversity in the world. More than 1300 of the world’s 6-7000 languages are spoken there, many of them undocumented and certainly a huge number are endangered. So my most important mission on this trip is to get acquainted with the cultures of Melanesia. Other than that I want to learn how to sail better (I had a great sailing trip of a few weeks in Croatia with captain Zeljko last year). Also, sailing, although quite challenging on the body and mind, can be quite relaxing and I hope to have enough time to catch up on reading books and my video and photography skills. When I first came here I added one more mission: learning Persian since we had two nice Persian crew members onboard willing to teach me (one day I will travel Iran by bicycle but that is another story). Now that they are not coming along, I still hope to be able to make some progress by myself. And me with a Kathakali traditional dancer. We attended a show organized for us at the place where we are staying. It takes 3 hours for the dancer to get prepared for the show. And finally, ta-dam! Liberty is a 15-meter ferrocement boat, built in New Zealand but now travelling under the Vanuatu flag. Gerd has owned and sailed it since 2008. Liberty is by far not a luxury yacht but all of her equipment is very well maintained (we are spending quite some time here in India making sure everything is as it should be after all). Liberty would have made very good friends with my South American bicycle Traicho, with his milk crate instead of panniers. She has two kitchens, comfortable berths and a lot of space on the front deck. We are taking good care of her and I am sure she’s gonna take good care of us in the coming months. Liberty was docked at the international marina in Kochi – the only marina in India and the only marina between Dubai and Singapore. This is where we did most of the preparation work. 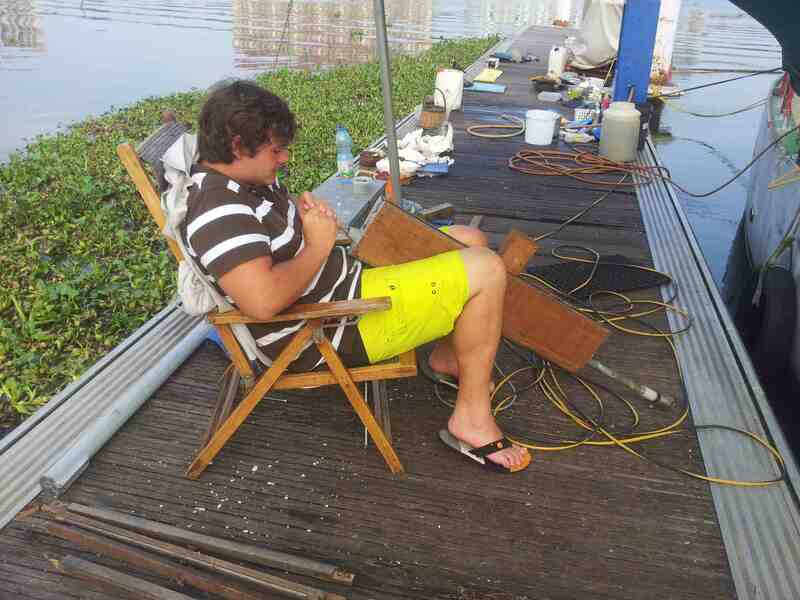 We had plenty of space on the pier to do our work and have a good time. The marina is on the island of Bolgatty – the first island settled by Europeans in India, basically where the colonization of the whole subcontinent began. The marina is attached to a five-star (well…) resort that is housed in a Dutch palace from the 18th century. There is a nice swimming pool that we use for free and the views of the city across the river/bay are nice. A very quiet place and perfect for us. We also managed to get to see some of the area around Kochi. We spent some time in Ernakulam, a satellite city of Kochin, across the water, mostly for shopping. 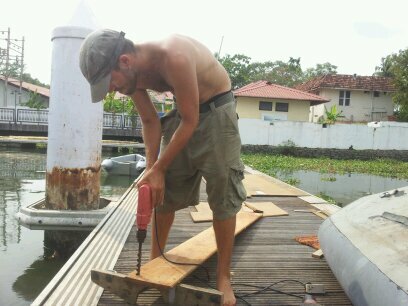 And we did a great day trip in our dingy up the backwaters of Kerala. I am certainly coming back to India – an ocean of cultures, landscapes, people and smells in itself. So this is the first and long blog post, therefore a bit dry, from this trip. I hope to be able to update as much as possible from where the real adventures will happen. We are now anchored in the bay of Kochin and hopefully tomorrow we will finish doing the paperwork for clearing out and leave on the long voyage to East Timor. 40-50 days of sailing, probably not much connection to the outside world.